Sol Palmanova All Inclusive offers a perfect all-inclusive vacation in Palmanova, Mollorca. It is only 100m away from the Palma Nova beach in Mallorca. 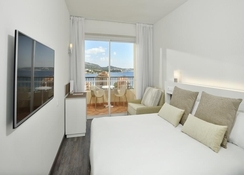 If you are looking for family-friendly Palma nova hotels, then this is a perfect spot to spend some family holidays. There are four outdoor pools in the hotel, including two pools for kids, plus, a kids’ club that is filled with plethora of action-packed activities. If you’re seeking for a peaceful family break away from the hustle and bustle of city life, then this hotel will perhaps solve the purpose. Surrounded by lush green gardens and exotic views of Palma Nova Bay, the hotel is a treat for everyone. Other than that, you have many shopping and entertainment options, including restaurants, bars and nightclubs within 300m from the hotel. And with the hotel’s all-inclusive option, you don’t have to lift your hand for anything, simply enjoy your vacation with your family, as the option will cover everything from your meals to your daily activities and entertainment. Set on the exotic Palma Nova Bay, Sol Palmanova All Inclusive is about 100m away from the gorgeous golden sandy beach, which is considered to be one of the best beaches in Mollorca. The guests can find the city centre within 300m from the resort, which includes various shopping and entertainment options like restaurants, bars and nightclubs. To further explore the island, you have links to the public transport within 50m. The Palma de Mollorca Airport is about 29km away. The hotel offers 653 well-furnished rooms, from family size to standard. All the hotel rooms are furnished and come with a private bathroom, telephone, safe deposit, air conditioning, TV, free Wi-Fi, and a terrace with stunning views of the Mollorca beaches. 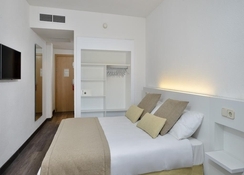 Family rooms are bigger in size and the hotel also offers interconnected bedrooms for up to five people (three adults and two children). Room service is available round the clock. The hotel’s main restaurant serves breakfast, lunch and dinner in buffet style. The restaurant serves a wide selection of salads, fish and meat dishes, some of which you can watch being prepared on show cooking stations. There’s a kids’ area, too, in the restaurant. Kids have their own dinner buffet, where they are supervised by the activities team. There is a wide range of drinks that are served in the restaurant, including red wine, white wine, beer and exotic mix of spirits and cocktails. There is a bar serving a nice range of snacks, including beans with tomato, bacon, fried potatoes, pasta, sausages, sandwiches, toasts, marmalades, butter and fruits. Sol Palmanova All Inclusive is one of the few hotels in Palma nova that has four outdoor pools with a kids’ section, including a lagoon and a swimming pool for babies. Additionally, the hotel has a new water park, gorgeous sun terrace and a playing area for the grown-ups. There are plenty of sports and leisure facilities that include table tennis, volleyball, a shooting range, gymnasium and aerobic activities, water polo, archery and many other sports. There are nightly entertainment shows, cabarets and professional shows for the adults, while kids have their own planned activities managed by the kids’ club and a playground. The hotel has a great location close to the beach. Good food. The entertainment is good but in the space before the entertainment kids run wild playing football on the stage with no thought for the younger children trying to dance. Although the parents should keep them under control. May be an idea to not allow ball games on the dance floor/stage.